New York—On Thursday, October 19, Swann Auction Galleries’ sale of Art & Storytelling: Art & Photobooks combined works spanning the lifetime of the medium into an auction intended to “highlight the interrelationships between fine art, documentary and vernacular photographs,” according to Daile Kaplan, Vice President and Director of Photographs & Photobooks at Swann Galleries. Ms. Kaplan has long been an advocate for the inclusion of vernacular works and photobooks in the fine art sphere, and organized the first auctions devoted to those subjects in 2014 and 2006, respectively. She added, “We're successfully building a new, broader market of crossover and emerging collectors who enjoy discovering the ways in which art tells a story." Interest in vernacular photography was so high that the opening bid for many works exceeded the high estimate. One of the sale’s biggest surprises was a circa 1915 salesman’s album for the Eberhard Faber Pencil Company, containing 86 hand-colored silver prints of pencils, erasers and marketing displays, which sold for $10,625 to an institution, above a high estimate of $2,500. Documentary and photojournalism works were included in this category, with Margaret Bourke-White’s silver print Gold Miners Nos. 1139 and 5122, 1950, for a Life magazine story about apartheid in South Africa, reaching $17,500. The highlight of the sale was an extraordinarily scarce 1862-72 album of 67 photographs depicting South Asia and China credited to John Thomson, which sold for $45,000. Other notable photobooks included Volume X from Edward S. Curtis’s seminal work, The North American Indian, 1915, and the deluxe limited edition of Ansel Adams's Yosemite and the Range of Light, 1979 ($12,500 and $20,000, respectively). Several long-standing auction records were broken for important works, including the complete BAM Photography Portfolio I, 2000, with photographs by Richard Avedon, Nan Goldin, Annie Leibovitz, Richard Prince, Cindy Sherman and others, which sold for $26,250 to a collector. 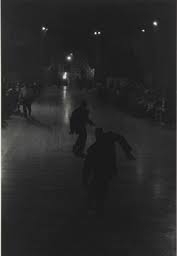 A new record was also established for Saul Leiter, whose atmospheric chromogenic print Waiter, Paris, 1959, sold for $25,000, above a high estimate of $9,000. Another highlight was a 1981 printing of Roy DeCarava's Dancers, 1956, which nearly doubled its estimate, selling to a collector for $37,500. The dramatic work depicts a darkened Harlem dance hall, where one imagines the subject of Horst P. Horst’s 1987 silver print, Round the Clock III, New York, would feel right at home ($15,600, a record for the work). Iconic works by Diane Arbus, Robert Frank, Ormond Gigli and Irving Penn were also met with head-to-head bidding. The next auction of Photographs & Photobooks at Swann Galleries will be held in February 2018.